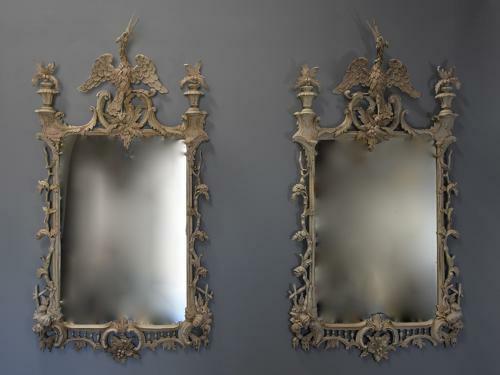 This pair of mirrors consist of carved wooden frames finished in a light grey tone with carved ho ho bird to the top with carved C scrolls, foliate and berry carved decoration and carved foliate and berry finials to either side. The side supports consist of carved branch and leaf decoration leading down to carved C scroll with foliate and berry carved decoration to the centre with carved balustrade design, the lower corners having foliate decoration with an upturned urn with cascading water. This pair of mirrors are in excellent condition for age, the mirror plates are in good condition with slight foxing, they are both of stable construction and can go straight into a home. Please note: the mirror plates have been obscured for photographic purposes.